In rainforests and tropical forests all across the world, deforestation, human activities and climate change are having a huge impact on both vulnerable eco-systems and the wildlife that depend on them for survival. 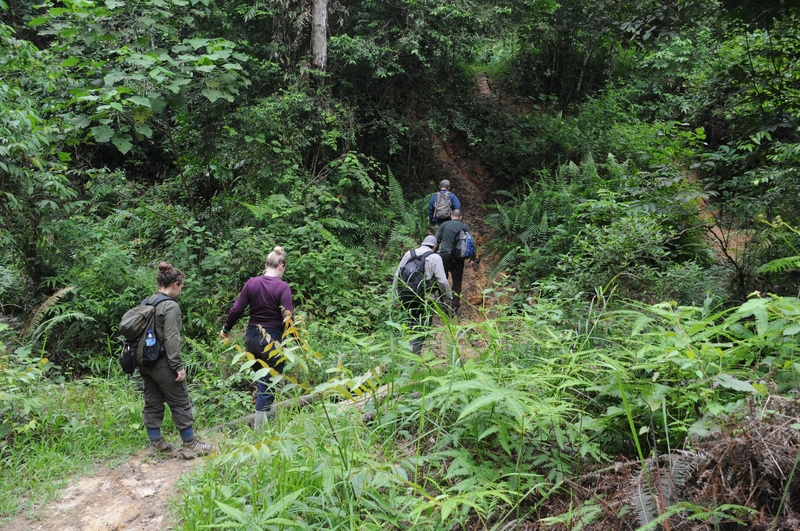 For the last few years, researchers and students at Bournemouth University have been working in the remote forests of North Sumatra to find out what these changes mean on the ground. LEAP (Landscape Ecology and Primatology) is led by Associate Professor Amanda Korstjens and Professor Ross Hill from BU’s Department of Life & Environmental Sciences (LES). They are supported by a number of postgraduate students. In the tropical forests of northern Indonesia lies the Sikundur monitoring site, run by the Sumatran Orang-utan Conservation Programme (SOCP) which for several months of the year, is home to BU staff and students. From here, the team carry out research to understand changes in the forest and how this affects species such as orang-utans, siamangs, gibbons, Thomas’s langur monkeys and elephants. Dr Amanda Korstjens explains the project: “It’s all about disturbances to the forest – both from humans and climate change – and how that affects the forest structure and carbon stock. We’re also exploring how different primates and elephants use the forest, depending on its structure and vegetation and how they respond to changes in their habitat. The project site is set up as a student learning platform, where PhD and Master’s research students spend several months carrying out their fieldwork. Some undergraduate students have had the opportunity to spend a short amount of time in the region, giving them an insight into future conservation careers. The elephant project has also included project work by three Indonesian Master’s students. “It’s great for our undergraduates to get their first experiences of living and working in the tropics. It can be quite a daunting prospect to go alone, so travelling together as a group makes it much more manageable,” explains Dr Korstjens. “Our PhD students and postdoctoral researcher work on a variety of projects, using cutting edge technology including airborne laser scanning to assess the forest structure, as well as photography from drones. These developments in technology are not only helping the advancement of science and research methods, but are also being used by local organisations in the area to monitor poachers and forest loss. Several now have their own drones, which enable them to keep watch over vast areas of forest and mean that eventually they may also be able to use the methods being developed by the LEAP team, especially by BU’s postdoctoral researcher Dr Cici Alexander as part of her European funded Marie SkŁodowska-Curie project. The data gathered by Bournemouth University’s researchers is being fed back to local conservation organisations, such as the Leuser Conservation Forum (FKL), HAkA, and the Sumatran Orangutan Conservation Programme of the YEL-PanEco consortium, BKSDA, and activists, including Rudi Putra, and Dr Nursahara (from the University of North Sumatra) and Dr Abdullah (from the Syiah Kuala University in Aceh). They are then able to use the results to change the way that conservation takes place in the area. It’s an ideal partnership as research teams are able to contribute their knowledge, while local people are able to make a difference in practice. “We provide them with the data they need to be able to properly and effectively protect the forest and the animals,” explains Dr Korstjens, “They are involved in the management of the site and of the parks. They talk to the government and other local organisations in a way that we simply wouldn’t be able to. One of the PhD students involved in the study, Chris Marsh, has shown that temperatures can differ by up to 10oC between locations. An increase in temperature is particularly noticeable when trees have been cut down, as the remaining trees are more exposed and become hotter. By demonstrating the link between the two, the team hope that local organisations will be able to make a difference to conservation and logging practices. For more information, visit the project website: www.bournemouth.ac.uk/brc-go-leap.